Have you seen any cute maternity exercise clothes at your local department store? Were the maternity exercise clothes you found affordable? I had a very hard time finding cute fitness apparel when I was pregnant with Emma. I really wanted something to get me through the awkward stage when people at the gym weren’t sure that I was pregnant because I was only showing a little, so several of them said really ignorant things like, “Hey, I see you in here training people a lot, but are you not able to workout much yourself?” Or, “Hey, are you not working your abs as much recently?” … Yes, I promise those questions are verbatim around 18 weeks pregnant. Read more of the ignorant comments from guys at the gym here. This week I have the privilege of partnering with fellow pregnant FitFluential ambassadors to bring you a great prenatal give-away series. Katie from Moms Little Running Buddy, and I reviewed and are giving away an entire maternity exercise clothes outfit from For Two Fitness! Check out my “Sweating for Two” shirt to the right. So cute, right? Katie is also featured in her “Running for Two” shirt. When I saw the shirts on the For Two Fitness website, I wasn’t sure if I would like the material. However, I LOVE it! After the first workout I did in the shirt, my shorts were soaked with sweat, but my shirt was not wet at all. It’s a great mix of materials. I have worn the shirt for 3 workouts so far and gotten countless compliments. Even from my male clients. And it’s nice to know that no one will mistake my baby bump for some pudge or a post holiday gut. I am so excited that one lucky winner will have the chance to win both a For Two Fitness maternity exercise clothes shirt AND the Capri pants. But, here’s something even cooler: For Two Fitness has extended a 20% discount to ANYONE who wants to purchase the apparel. Just enter the code: FitGiveaway before Feb 1, 2013. Follow the instructions below and enter the give-away. And remember, even if you’re not pregnant now — this is great maternity exercise clothes for your favorite pregnant lady in your life. Be sure to “Like” my Facebook Page to stay up to date with other prenatal fitness give-aways this week and next. Molly from Miss Molly Motivates is giving away a Prenatal Yoga DVD. I will be reviewing and giving-away a healthy eCookBook for busy moms AND a one hour consultation from New Leaf Wellness, and Jess from Blonde Ponytail Fitness will be giving-away products from GNC and Reebok. Stay tuned! 1. (Required) Leave a comment telling us your best advice for moms to be. 2. 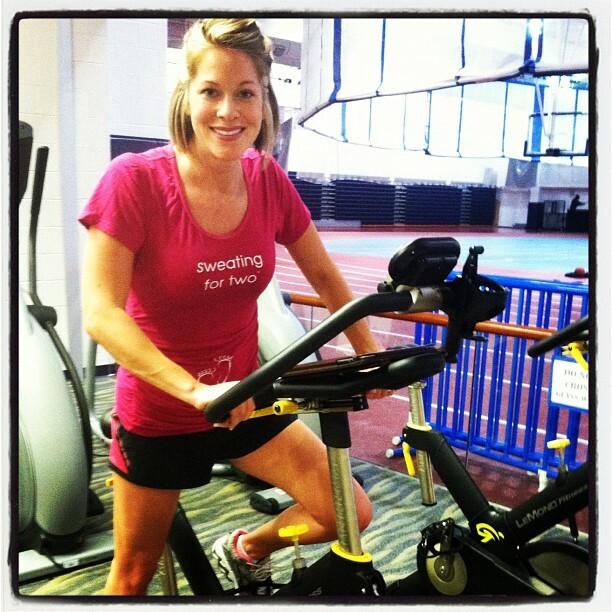 Pin a photo from the blog post (Amanda or Katie sporting the For Two Fitness attire). I’m a new mom-to-be so I don’t have any personal advice, but some of the best advice I’ve heard is to do what’s best for YOU and YOUR family. Everyone and every child is different! I “like” For Two Fitness on FB! I follow For Two Fitness on Twitter! I follow Fit Pregnancy & Parenting on Twitter! I like Fit Pregnancy & Parenting on FB! I liked Fit Pregnancy and Parting on FB! The best thing I did to feel good during my pregnancy was to keep moving! I was put on semi-bedrest for a couple weeks and asked if I could go back to my normal workouts because I felt so much better!! So keep up the workouts!! I’ve been trying to keep up with exercising but a cold put me on the sidelines and now I’m struggling getting back into the swing of things! I am a first time mom myself, so I don’t have any advice, but will certainly be checking back to see what advice is given! I am follower of Fit for Two Fitness on FB. I am follower of Fit for Two on Twitter as well! You have been pinned on my Pinterest. I follow Fit Parenting and Pregnancy on FB as well. I’m a mom-to-be and need all the advice I can get! best advice – try going vegan or paleo for you and your babe! Don’t follow the I can eat anything I want because I’m pregnant. Choose to eat healthy and you will feel great and so will baby! While I am not preggo now I hope to be again and LOVE this line! I’m not a mom (yet!) so I don’t have any advice from experience, but I guess the advice I hear most is to enjoy it because it’ll fly by! Best advice I can give is to sleep when your baby is sleeping. IM following and i also believe best advice for moms to be is to listen to yourself and do what you think is right !!! Echoing the advice from above – do what feels right for you and your family. YOU are the mom and you know your baby better than anyone. Liked For Two Fitness on Facebook! Liked Fit Pregnancy and Parenting on Facebook! I am a new mom to be too so I don’t have any personal advice but I do recommend praying for your children or future child each day. I am only 12 weeks but I have been praying daily for this little baby and that they may grow in the grace and knowledge of my Lord and Savior Jesus Christ. Stay active SOMEhow, even if it looks drastically different than you’re used to. Your body and baby will thank you during labor and beyond! Whatever you do, DO NOT STOP WORKING OUT DURING PREGNANCY (unless you have to)! I had to stop running due to the procedure we went through to get pregnant, and it has been so hard to get back into the routine. My advice is to trust your instincts and ignore everyone else’s advice! Liked For Two Fitness on FB! New Mom advice? Sleep while you can. I’m pregnant with #2 and there is no rest time in sight… enjoy the last couple moments before your life gets that much better! I liked For Two on FB! I like Fit on FB! Would love to win this- plan on sweating for two for the next 7 months! Advise for moms to be- the more you let your young toddler get away with, the more fights you will have when they can talk and negotiate! Don’t let them do it once if your not ok with them doing it ALL the time..Ex: not sitting in a stroller at the mall, sitting on the counter while mom is making dinner, not sitting in a high chair for dinner etc. My best advice for new moms, is don’t be afraid or feel ashamed to ask for help. You don’t have to do it all, laundry will get done eventually. Try to relax and rest when you can and enjoy the moments when your baby is so little. They grow so fast. i’m a mom to be. and i have to say that getting sleep is #1! I am a mom to be so I don’t think I can offer much advice, but what I’ve learned so far is not to compare your pregnancy or any aspect of it to any of your friends, bloggers, etc. It’s different for everyone one so take everything you hear and learn with a grain of salt as it all may not be true for you and your pregnancy. I like Fit Pregnancy and Parenting on FB! Expecting my first, so no advice from me! 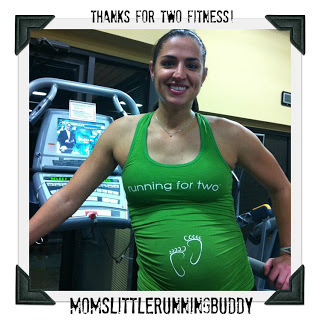 The “sweating for two” tank was the first thing I bought when I found out I was pregnant! I’d love a few more comfy pieces! Def. following them on Facebook and twitter!! The best advice I can give is to listen to your body. It will tell you what you can and can not handle. I love that there is somewhere for moms to be to get advice on exercise and nutritution for actual mom to be. Not someone who has never been through pregnancy. My best advice: relax. And trust your gut. I liked For Two Fitness on Facebook! Thanky Thanky for all this good innofmatior! My best advice for moms to be is keep moving. I’m at 16 weeks and still working out and I feel great! I have slowed my lifting a bit and my running pace because I don’t want to do ANYTHING that might be dangerous, but my doctor said working out while I’m pregnant benefits both me and the baby! WIN WIN! I am 17 weeks pregnant with my 4th child and have been working out each morning. My stamina is better through the day and I start my day off feeling loose and ready to go. My joints also do not hurt like they used to when going up stairs. I am excited to see the good results continue as I progress. Whatever you do keep active. My kids love to exercise with me if I do not get it in before they wake up. What a great example to your kids to stay healthy and fit. listen to peoples judgments and be choosy with your dr…this is your baby and your pregnancy..you have the right to be heard.